Cost Plus Management Services of Alameda, Calif., is recalling about 2,300 Hartley flip daybeds. 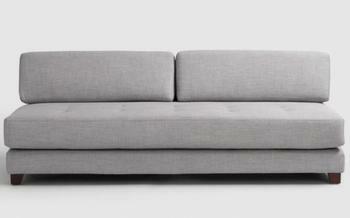 This recall involves the Hartley Flip Daybeds, a light gray upholstered duet daybed sofa. The SKU/UPC 535790/00000025357905 is printed on the UPC label attached to the underside of the daybed. The daybeds, manufactured in China, were sold exclusively at Cost Plus World Market and World Market stores nationwide and online at www.worldmarket.com from January 2017, through January 2018, for about $550. Consumers may contact Cost Plus toll-free at (877) 967-5362 from 7 a.m. to 12 a.m. (ET) any day or online at www.worldmarket.com and click on “Product Recalls” at the bottom of the page for more information.